Summary: It’s crazy! Fifteen-year-old Masi Burciaga hauls bricks to help build a giant pyramid in her neighborhood park. Her neighborhood is becoming more of a ghost town each day since the lard company moved away. Even her school closed down. Her family’s bakery and the other surviving businesses may soon follow. My thoughts: Masi worries about her neighborhood, the family bakery, and her parents too. She has many issues pulling at her emotions, but she is also a young person wanting to enjoy her summer hanging out with friends and maybe even experience a little romance along the way. Masi looks at the neighborhood revitalization plan as one way to take care of several things. With everyone working together, she gets to spend time with friends and maybe a special someone along with solving her family’s financial problems. She gets behind the plan and works hard at every task she is given. I found it a bit unrealistic that the adults in the neighborhood signed onto the somewhat sketchy plan so quickly, but as a reader, I decided to just believe it anyway. The book really focuses on community and their willingness to sacrifice and work for the greater good. It also gives a picture of a few people who are willing to say, do and sell anything to get what they want. There is a huge contrast between the two types of characters. There wasn’t a lot of gray area there. The family bakery was my favorite place in the story. I wanted to spend more time in the kitchen. The descriptions of so many breads and cookies made my mouth water. I was truly hoping to see a recipe for the Ginger Pigs, or marranitos, by the end of the book. They look like gingerbread, though it is molasses that is giving it a distinct flavor and color rather than ginger. Since there was no recipe and they sounded so yummy, I started looking online and found many recipes for this traditional Mexican cookie, so I may still get to try them. The main character is fifteen and her romantic interests are only a year or two older. Masi is a sweet and innocent girl and her flirtations are also. She and her friends are mostly together only around the community events. We don’t see them interacting much beyond the neighborhood issues so I had less of a sense of who the other teens were. 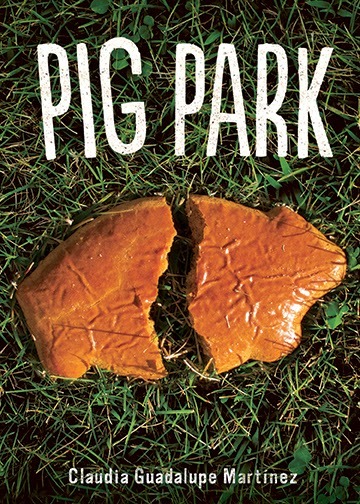 I would classify Pig Park as a young adult book because of the ages, but it is on the younger side. It would be a great title to offer when people are asking for what they often call “clean reads” for teens. Recommendation: Get it soon if you work with tweens or middle schoolers and want to add some diverse realistic fiction. Otherwise, borrow it someday. Even with financial issues and a potential family split, it is a fairly light and fun look into a unique urban neighborhood. Really looking forward to reading this one! Thank you for the review!